Sometimes things happen to the concrete where your business is located. It could be from the weather, wear and tear or even damage from a specific event. When that happens, water can come into the ground and that can compromise your business’ foundation. That’s when you end up paying a lot of money to get the foundation for your building fixed. That’s money that can really add up. Because it is an unnecessary expense, take steps to prevent the damage that comes from a compromised concrete section on your property immediately after recognizing the damage. Hydrostatic pressure is the result of water leaking into the foundation and causing the building’s foundation to be unstable. Also, erosion can happen and soil can shrink as well. When that happens, the foundation is further compromised. All this together means that your business’ foundation is going to fail. If that is happening in your concrete, then the time is now to get it fixed. If you are unsure if your concrete really needs to be fixed, then here are some signs to know that it’s time. – Doors that do not close properly. Discover why a professional commercial concrete repair product is a cost effective solution. That way you can have that reassurance that your building is on a solid foundation. Kwik-Bond can fix concrete floors. 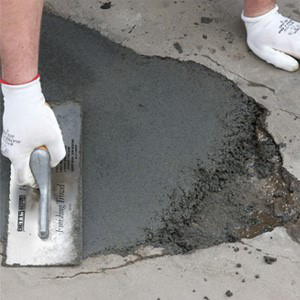 Here is why our products are chosen to fix concrete and how they provide worry-free repairs. – It works great for coolers. – It is also hard, but never brittle for prolonged stability. – It can even be applied in wet conditions. – Once applied, it is even flexible to help change with the weather.